Two Mass Screens – What is the Opportunity? Why Do You Want It? New Tech can be hard to wrap your head around. We get that. But Focus on what you want out of it and you will have great results. What follows is a discussion of one high profit-generating tech. There are many others ‘out there’ we can implement too. Progressive industry participants, the real survivors, focus on ‘getting it in and working’. Mines that can make step-change improvements to their bottom lines will be the ones with solid answers to important industry survival questions coming in the not too distant future. Is this you....? Read on. WHAT'S THE MAIN STORY HERE? GIVE IT TO ME QUICK! Now in their 4th generation, STM screens have been used around the world for decades. These screens are not cheap. But, because they are so strong, they get used a lot in hard rock and iron ore applications, often as retrofits to replace failing banana screens. They have the very useful feature of being able to handle much higher throughput (if you set the process parameters up correctly). Plus they are super reliable as they don't break and are easy to work on. The most important thing going on here is that these screens have a constant bed depth down the entire length, and material stays on the deck for more than double the time of a typical banana screen. Making for very high screening efficiency, with under half the power needed to do it and deck panels lasting more than double. So iPUT patented this process and established an exclusivity arrangement (without adding to their cost), and now provides full turnkey design-construct solutions for existing and new mines. HANG ON, HOW DOES THAT HAPPEN AGAIN? A 'brute force' banana screen activates the whole mass, whereas a two mass screen only needs to activate a (relatively) lighter trough mass to get the particles excited and passing. And the flat deck and lower travel speed means they get a lot more opportunities to pass. The awesome physics of the exciter and trough mass 'opening and shutting' in sync, means one is largely cancelling out the inertial forces of the other. Hence only a small amount of vibration gets to the support structure, so they are a lot quieter. The energy to activate a smaller exciter mass typically only needs 1/3 the kW power, often while doing a bigger job. Much lower panel wear rates occur from the low wear mechanism of a bouncing action on two mass screens .vs. high wear from sliding on banana screens. 'MAGIC HAPPENS!' FAQ; IS THIS ANOTHER SILVER BULLET WE DON'T NEED? 'Disbelief', the number one question; eg "Surely you would bury a screen if it was going half the speed and 50% or more on it?". Think about it like this. You know what the discharge of a regular banana screen looks like. The STM is discharging at about the same speed, so the bed depth is only 'a bit higher' at the discharge; even doubling it would be fine for most screens you have looked at, right? The big win is that the STM has been doing that down the entire length of the deck, rather than on a banana screen where material races down the top 2/3 of the deck and only slows down at the end. So draining happens quickly on the STM, leaving more time to rinse even better. Same for desliming or other separation tasks - more for longer gives better results. The particles don't care, but they do respond well to increased stimulation! Add a cascade deck for enhanced stratification on lighter material like coal. This tech 'just works'! Much more is possible, and we have proven it works in coal and iron ore. If you have a market for increased mine production, or are interested in the concepts detailed below in 'Growth Potential', a two mass screen conversion, including required upstream and downstream throughput handling modifications, will typically have a payback period of a few months. And keep the bottom line much healthier for decades after. No other method can achieve the performance density achievable by a properly configured two mass screen based process. Less equipment is needed to do the same job. Costs were $5 and $4 per tonne of annual capacity installed in retrofit case studies for a coal and an iron ore site respectively; an extreme bargain by industry standards! Existing plant retrofits may be limited to a practical ceiling of 30% to 50% annual throughput increase, depending on current configuration. New plants, in an identically sized beneficiation module, can readily achieve a minimum of 40% better than a state of the art design configured with conventional brute force screen manufacturers, for much lower $/t installed pricing. 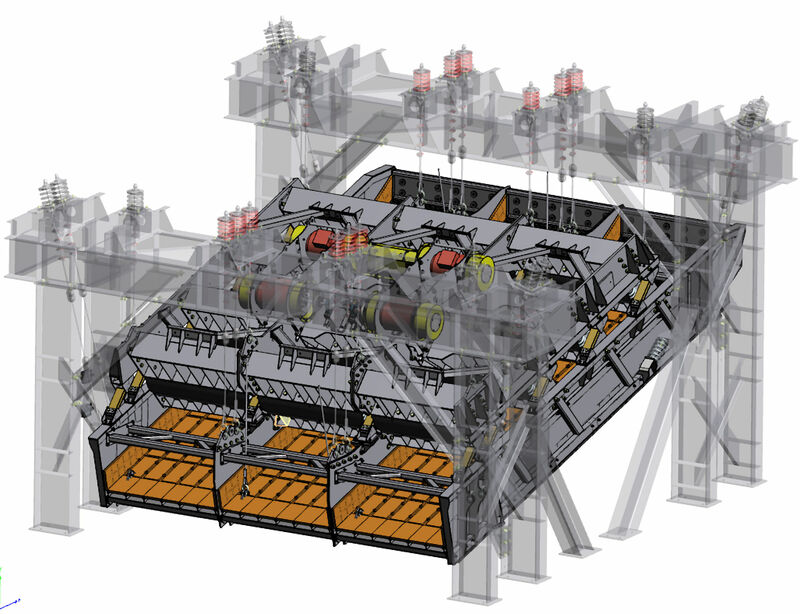 In coal, two mass screens can reliably handle 1900 t/h per module with 4.8 m x 7.3 m screens. Existing screen technology stretches to get to 1200 t/h per module, and it is widely regarded as a consumable item at those throughputs, requiring additional maintenance structure. In iron ore, the numbers are even more impressive! Bolt in replacement for existing screens with relatively minor upgrades to related equipment; eg conveyor drive/s, minor access & piping mods, minor electrics and possibly pump/s. Upstream and downstream mods to handle the increased throughput are typically straightforward and readily implemented. Using the operational characteristics of these new-gen screens, cut points can be reduced to take the load off existing fines circuits which will then see a similar total loading, but with better size distribution where the fines circuit can perform more efficiently. The net effect is positive for yield. Improve feed ore data and responsiveness of process control in the ways we would suggest and significantly more upside becomes accessible. While throughput increase means higher t/man year, the two mass screens have deck life easily triple that of conventional screens, so increased availability means outage periods can be extended. Implemented holistically, 7,500 operational hours pa is expected from this technology and 8,000+ is achievable. WHO IS BACKING THIS TECHNOLOGY AND WHY WILL IT WORK? 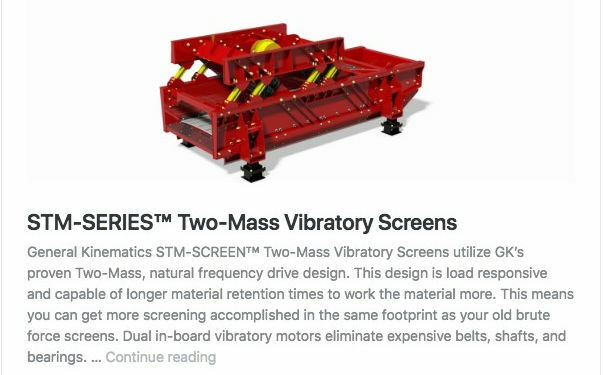 General Kinematics Corp (GK) is a USA based company that has been a dominant provider of vibratory screening equipment for over half a century. See here for an insight to their background. They are a mature and capable partner with great depth - exactly the kind of principal technology provider you would want to see when undertaking substantial process upgrades. Around 2005, GK rationalised their existing screen range and developed a Standardised Two Mass (STM) modular design. Thirty-one of GK's two mass screens were installed in Australia, in various industries and styles, in the 5 years since appointing Skala Australasia as their Australian distributor in 2012, with more coming. Around the world, GK has over 150 of the same style of large two mass screens as the one applicable to Australian applications, and hundreds more including all two mass screen types. GK are fundamentally an engineering products company. If there is a problem they are looking for a rapid, complete solution, not making excuses. They demonstrated this beautifully, to a standard never before seen in the Australian mining industry, when teething problems were encountered on the first Australian coal installation (see here). A convenient side-effect of the early issue was that a number of features uniquely benefiting the Australian coal industry have been 'baked in' to produce an order of magnitude better screening product than the industry has seen before. SO, WHAT ARE THE RISKS HERE, REALLY? Technically, very low. Everything about existing process performance is well understood. When a better tool becomes available to liberate performance from the principal bottleneck, being the screens, technical implementation is quite straightforward. Normal business and project risks apply, eg weather and stockpiling around customer needs. All quite manageable with good planning, which our senior personnel are well versed at. Peer review and independent verification are excellent tools. GROWTH POTENTIAL OF THE TECHNOLOGY? Produce a new premium grade low-ash HELE coal product with minimum disruption to existing facilities. This may prove to be a key strategic opportunity in the future market, if available seams are suitable. Previously marginal seams may become economically attractive. Linking the inherent attributes of the reconfigured beneficiation plant to explosives and handling practices is another area to realise further bottom line efficiencies. Fully automated 'Super Washeries' are also entirely viable. Operated remotely using GK's STM 5.4 m x 8.5 m screens, which already exist, and noting 6.6 m x 10 m screens will be built, according to GK, "for the first customer that wants them; we have the design!". Change work time balance to less expensive periods (eg less weekends / public holidays worked) to meet customer commitments more efficiently. For an existing plant, a quick initial feasibility study will validate and quantify the potential. Whilst iPUT has patented and established exclusivity arrangements for two mass screen technology upgrades, considerable flexibility exists as to how to proceed from there. A technology licence to use existing resources with suitable oversight may suit some. However, we already have good partnerships with highly reputed industry majors and leveraging these via a suitable JV could rapidly implement the technology for a lesser total cost, under a cashflow positive off-balance-sheet lease arrangement or other suitable design-construct mechanism. A new plant is similar, except that BOO, BOOT and BOOM or other options, potentially in conjunction with a selected mining contractor, all become viable. There is a lot written about this technology which the above only touches on. The more useful / relevant docs are summarised for download below (Right click, 'Save As'). GK STM 5.4m x 8.5m screen, top support option. Being built.